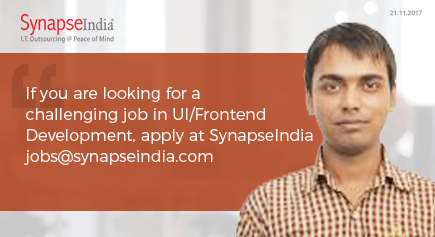 Get complete details about SynapseIndia jobs for the profile of UI/Frontend Development. The company offers a challenging work-environment where you will get the chance to work on latest technologies alongside experienced professionals. As a Frontend Developer, you will be responsible to translate the company’s and customer’s needs into functional and appealing interactive applications. At the organization, you will also get an opportunity to continuously learn new things as well as discover your inner potential.